I received product for review. The opinions within this post are of my own and I was not influenced in any way. Please do your own research before purchasing products or using services. Your opinions and results may differ. This post contains an embedded video. 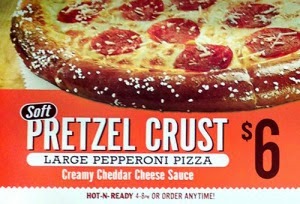 Little Caesars proudly introduces a large, soft pretzel crust, pepperoni pizza for just $6! Bringing two classic flavors, soft pretzel and pizza, together for a limited time. It has a flavorful, buttery, soft pretzel outer edge crust and is topped with creamy cheddar cheese sauce, a blend of 100% real cheese, and pepperoni. It's finished with a 4-cheese gourmet blend of Asiago, fontina, Parmesan, and white cheddar cheeses. Hungry? Get to Little Caesars right now and try the new Soft Pretzel Crust Pepperoni Pizza for a limited time, for just $6! HOT-N-READY 4-8PM or order anytime! Little Caesars, world's easiest way to pizza! My family loves to get our grub on with Little Caesars pizza. It's one of our favorite pizza chains, both for taste and affordability. Last week we tried a couple Soft Pretzel Crust Pepperoni Pizzas and it gave us another reason to like Little Caesars. I wouldn't necessarily say it tastes like pizza but it's tasty nonetheless. The golden soft pretzel crust is salted on the edges and the yellow cheese sauce is deliciously warm and creamy. Topped with cheeses and pepperoni, it's a new take on pizza that we all liked. The ingredients were fresh and the overall taste combination worked. 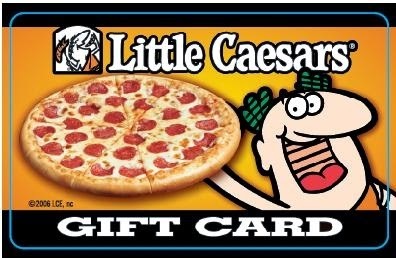 One person will win a $15 Little Caesars gift card. My boys have been dying to try this! I like a meat pizza with mushrooms and onions! I love pineapple and pepperoni together! I like mushrooms and onions. I love veggies like onions, tomatoes, mushrooms, and black olives on pizza. I am boring. I like pepp. I've been making Greek Pizza. I like Feta Cheese, Kalamata Olives, Artichoke Hearts, and Sundried Tomatoes. I like pepperoni and black olives with extra cheese. I like sausage the most. We are a meatlover family;) Some of us like veggies too! We just had Little Caesar's tonight! Our favorite topping on any pizza is Hawaian style , ham and pineapple. I love sausage, onion and mushroom! My favorite pizza toppings are sausage, mushrooms, pepperoni and black olives. I like pepperoni and sausage. chicken cheese bbq sauce and onions! There's not much I don't like on a pizza. I'm happy with everything but usually get pepperoni. I like onions and green peppers on my pizza! I like black olives and mushrooms. I'm nice and simple, I love cheese for my topping! My favorite pizza toppings are ham, pineapple & onion! My favorite toppings are bacon, Canadian bacon, and pineapple. I like Pepperoni and extra cheese and I always love to get Little Ceasars garlic butter dip with my pizza too! Yummy Yum Yum! We love cheese and pepperoni, but sometimes get the ham and pineapple. I'm a meat, spinach, and mushroom lover! I love 5 cheese pizzas, preferably with double the cheese! I haven't heard of it until now. I love pretzel crust, I'd try this one! I happen to like pepperoni and cheese. My boys only like cheese. My husband is quite different than all of us and loves to try all kinds of new types of pizza, but loves to get supreme pizza. I always get light sauce, bacon, onions and cheese on a well done crust. Yum...bacon! My favorite toppings are pepperoni and mushrooms. I like bacon and pineapple. I love pepperoni & onion! LOVE the $5 hot n ready little caesar pizza with just pepperoni! My favorite. I like pepperoni with extra cheese. My favorite toppings are pepperoni, onion, green pepper and extra cheese. I like red onion and jalapenos on my pizza. Yum!! I love to pile my pizza high with veggies, such as onions and spinach, and chicken. I'm simple: pepperoni and Jalapeno. I like sausage and onions! I like pepperoni, black olives, and mushrooms. My favorite pizza toppings are black olives and mushrooms. I like Canadian bacon and pineapple on my pizza. pepperoni and lots of cheese for us. I love pepperoni and bacon! My favorite pizza topping is mushrooms, but I rarely get it because the kids like plain cheese. I like extra cheese, sausage and mushrooms. I like almost everything. My favorite pizza is Combination/Supreme! Canadian Bacon and pineapple is a hit at our house. I love all the meats but absolutely cannot eat traditional pizza without pepperoni. Bacon, yellow peppers, and anchovies. Not kidding. I like pepperonis and mushrooms. We always choose pepperoni with extra cheese for our pizzas! I love sausage, mushrooms, and black olives on my pizza. Our favorite pizza topping is hamburger,onions,green peppers, mushrooms, and cheese. My favorite pizza toppings are pepperoni and onions. I like to have chicken and black olives!! I like pepperoni and black olives. I love chicken, feta, spinach and white sauce. We like pepperoni olives and mushrooms . I like pineapple, feta cheese, and black olives on my pizza. i really love bacon on pizza. it is my fave topping. yum. My favorite toppings is definitely bacon and cheddar. Great pizza. The pretzel crust does sound interesting. Will have to try that one! My favorite pizza topping is the classic pepperoni. My favorites are green peppers, onions and mushrooms. I like extra cheese, onions, garlic, bacon, chicken, and beef on my pizza. pepperoni, olives, onions and green peppers. cheese is the best topping!! Usually bacon and onion, or pepperoni and sausage and green pepper. I love buffalo chicken pizza! It depends on where the pizza is from... I love Hawaiian pizza but not from all pizza places. I love Little Caesar's pepperoni pizza. My favorite pizza toppings are ham and pineapple! I love ham and pineapple. I love sausage, mushrooms, and onions on my pizza. Bacon and cheese are my favorites. My favorite is pepperoni and bacon. My favorite is bacon and black olives but i usually get pepperoni for the kids. My favorite toppings are Pepperroni and Sausage! My order is simple ~ pepperoni! always. I love pepperoni and bacon. I love ham and pineapple on my pizza. My favorite toppings are pepperoni and onions. My favorite pizza topping is pepperoni, sausage, ham, canadian bacon, and cheese. I am a big pepperoni fan for pizza topping. I like green pepper and onion. My favorite toppings are pepperoni, sausage, peppers and onions. We keep it simple...plain ol' cheese! pineapples and sausage are my fav toppings. I like extra cheese and mushrooms. My favorite pizza is mushrooms and extra cheese. I like everything except anchovies or pineapple. The new pretzel pizza is my favorite. We usually just get pepperoni, but I love everything except anchovies! Thanks for the chance to win! My favorite topping has to be sausage! Pepperoni and lots of cheese! My favorite toppings include pepperoni and extra cheese. I just like plain cheese! I love Pineapple on pizzza!! I love sausage & mushrooms! Chicken and jalepeno is my favorite. I love pineapple and Canadian bacon. I love mushrooms, onions and artichokes on my pizza. My favorite pizza toppings are pepperoni, cheese and bell pepper. I love pepperoni and olives. Thanks for the giveaway…favorite pizza toppings are onion, peppers, & Italian sausage !